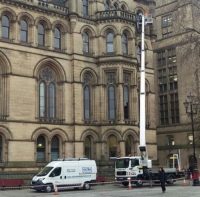 Providing support to businesses of all sizes across the North West of England and the rest of the UK, Ultra Cleaning Service is a specialist when it comes to commercial window cleaning and high-level maintenance. 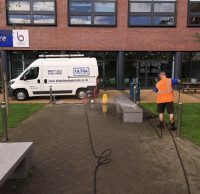 We also offer jet washing and rendering cleaning, gutter cleaning services and a variety of other contract cleaning solutions. Why Choose Ultra Cleaning Service? We promote a safe working environment. Our people put the health and safety of your staff and the general public at the forefront of all that they do. Ultra Cleaning Service is a proud member of CHAS (Contractors Health and Safety Assessment Scheme) and we are also Safe Contractor Approved to give you even more peace of mind. A discreet service. Our workers are very careful not be intrusive and they work hard to ensure their impact on your business, during working hours, is kept to an absolute minimum. Our talented staff have access to the latest equipment to ensure your building is cleaned to the highest standards. 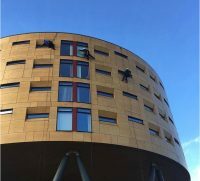 With powered access, rope access and abseiling window cleaners available we’re able to wash even the most difficult to reach parts of your property. Our abseilers are certified with both BS-7985 and IRATA too. We offer FREE consultations to ensure you get a bespoke service, specific to your business’s cleaning requirements. An affordable pricing structure means you’ll get great value for money without having to compromise on the quality of your cleans. Ultra Cleaning Service helps businesses from all sectors, across the North West and further afield. Typical clients and facilities include managed apartment blocks, facilities management and support services firms, professional services, leisure and retail, showrooms, industrial units, offices and many more. Being based in the heart of the North West, we’re perfectly positioned to help support businesses across Greater Manchester, Lancashire, Merseyside, West Yorkshire, The Midlands and the wider UK. Our regional nature means we can offer dedicated support and a fully personalised service to our customers. We work with clients in the big cities of Manchester, Liverpool, Leeds and Birmingham and they range from small businesses right through to large, multi-national, blue-chip corporations. 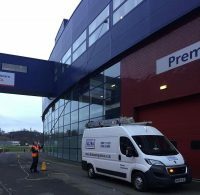 It’s not just the large cities where businesses can benefit from our cleaning support services though. We also love to help local firms across areas including Bolton, Blackburn, Bury, Preston, St Helens, Skelmersdale, Wigan, Blackpool, Huddersfield and many more across the UK too. No matter how big or small your cleaning project is, call us today to arrange a free consultation with a member of our team. Contact a member of the Ultra Cleaning Service team today, for your totally FREE consultation! By The Way...You Can Follow Us On Social Media Too!